The new issue of Thrust™ Magazine is now available to be mailed to your door. 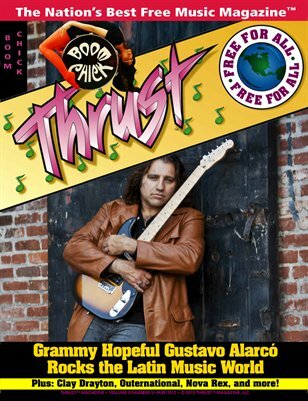 It features Latin music world Grammy hopeful Gustavo Alarcó and Motown hit songwriter for the Jackson 5 Clay Drayton. There's more too: We pick the best duos in music today, social activism rockers Outernational speak out against capitalism, and '80s glam-rockers Nova Rex make it big in a new documentary, airing on Discovery Channel. That's not all: Read the latest music news from around the globe, including Fender Guitars new partnership with Volkswagon and the VW Beetle, how Walk off the Earth has conquered YouTube, and what Horse Cave Trio means to the future of Detroit rockabilly. It's all in the new issue of Thrust™ Magazine. Have it delivered to your door.